Expedition 40 commander Steven Swanson, along with cosmonauts Alexander Skvortsov and Oleg Artemyev, have returned to Earth in their Soyuz TMA-12M spacecraft on Wednesday. The trio undocked from the International Space Station (ISS) at 7:01pm Eastern, ahead of a landing on the steppe of Kazakhstan at 10:23pm. Meanwhile, the launch of the next SpaceX Dragon spacecraft has been scheduled for September 20. Following a six month stay on the orbital outpost, the trio are concluding their space mission via the tried and trusted re-entry of the Soyuz capsule. The undocking marked the start of Expedition 41, under the command of Max Suraev of Roscosmos. Suraev and his crewmates, Reid Wiseman of NASA and Alexander Gerst of the European Space Agency, will operate the station as a three-person crew for two weeks until the arrival of three new crew members. NASA astronaut Barry Wilmore and Russian cosmonauts Alexander Samokutyaev and Elena Serova are scheduled to launch from Baikonur, Kazakhstan, September 26, utilizing the fast-rendezvous flight to the station. In preparation for that safe trip home, the Soyuz TMA-12M crew donned their Sokol launch and entry suits, closed the hatch between the Orbital Module (BO) and Descent Module (SA), and strapped themselves into their Kazbek couches inside the SA. The deorbit burn was the next key milestone of the return leg, conducted at 9:31pm Eastern, around one hour ahead of landing. 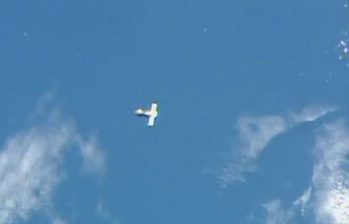 The Soyuz then eased its way to the ground under parachute, ahead of a landing southeast of Dzhezkazgan. The next immediate task involved the extraction of the crew from the SA by the Russian recovery forces that will race to the Soyuz’s aid. The crew were transferred almost immediately to the MI-8 helicopters to a nearby airfield, where the crew will part ways. Skvortsov and Artemyev will be flown back to Star City, while Swanson will be boarding a NASA Gulfstream III aircraft to be flown back to Ellington Field in Houston, Texas – via two refuelling stops in Glasgow, Scotland, and Goose Bay, Canada. Back on the ISS, the remaining crewmembers will soon have a commercial visitor prior to welcome, ahead of the next Soyuz docking. SpaceX’s CRS-4/SpX-4 Dragon has been officially scheduled for a September 20 launch from SLC-40 at Cape Canaveral – a surprise move after it was expected the launch would be targeted for the end of the month. 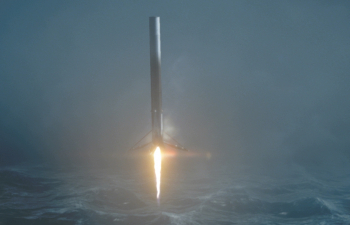 However, despite SpaceX being in launch action just this past weekend – with the successful ASIASAT-6 mission – the next Falcon 9 v1.1, along with the CRS-4 Dragon spacecraft, had already arrived in Florida, allowing for what will be a record turnaround for the California-based company. As seen noted in L2 CRS-4/SpX-4 schedule information, SpaceX workers are currently conducting post-launch maintenance on the SLC-40 pad, in preparation for a Static Fire test on September 17. Should all proceed to plan, SpaceX will then conduct a Launch Readiness Review (LRR) to confirm the vehicle is ready for launch. Approval will allow for the opening launch attempt to take place on September 20, aiming for what will be an instantaneous T-0 of 02:16 local time. Once Falcon 9 has completed her role of lofting the CRS-4 Dragon en route to the Station, more testing towards SpaceX’s fully reusable launch system aspirations may be conducted. (Image left is a screenshot from a stunning L2 animation video created by L2 members – click here to view). However, source information notes that this next Falcon 9 v1.1 is not sporting landing legs, meaning – if confirmed by SpaceX – the previously touted attempt to land the core stage on a barge will not occur on this mission. It is understood that this ambitious attempt will now likely take place during the CRS-5/SpX-5 mission. Meanwhile, the CRS-4/SpX-4 Dragon will be lofting her usual compliment of supplies to the Station. 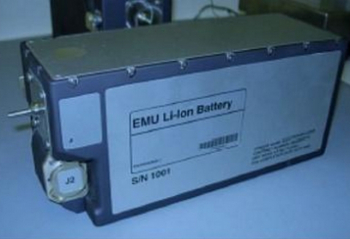 However, the manifest also includes two Extravehicular Mobility Unit (EMU) Long Life Batteries (LLBs). US EVAs on the ISS are currently postponed until the new batteries arrive on the Station. Two more batteries are set to ride on the next Soyuz. The Dragon will also be lofting ISS-RapidScat, inside her unpressurized Trunk compartment. 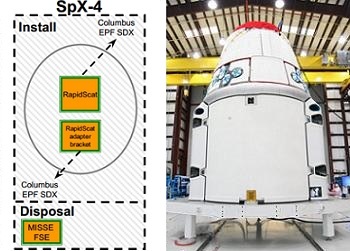 The experiment will be attached to the Station’s Columbus laboratory, via the use of the Station’s robotic assets that are now well-versed in removing and installing hardware from the Dragon’s trunk. ISS-RapidScat will study the Earth’s ocean surface wind speed and direction, returning a lost capability when the SeaWinds scatterometer aboard NASA’s then 10-year-old QuikScat satellite experienced an age-related antenna failure. (Images: via NASA, Roscosmos, NASA, SpaceX and L2. ).